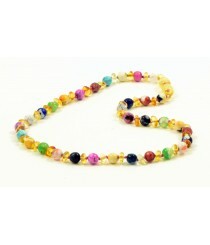 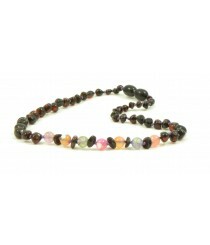 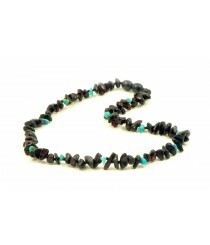 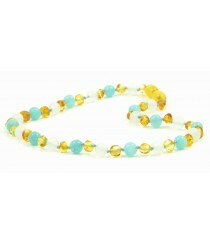 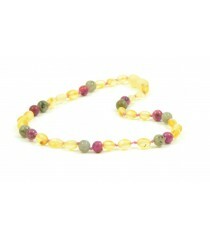 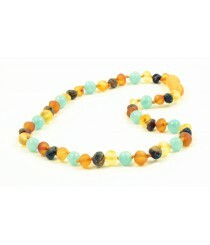 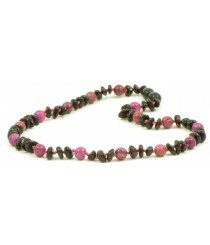 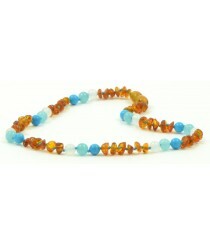 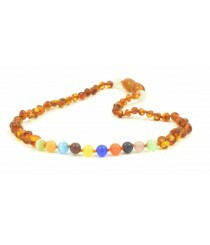 Amber and Semistone Teething Necklaces There are 23 products. 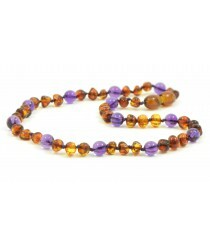 Amber & Semistone necklaces can offer not only teething benefits, but they also are also stylish & beautiful looking accessories. 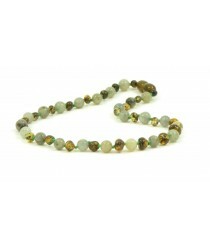 Different types of stones makes designs more vivid and also most of the semistones are known to have some potential benefits. 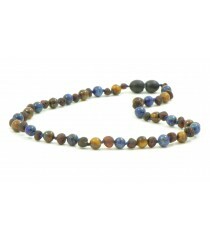 - While we offer our own design Semistone & Amber Teething Necklaces it is also possible to order your own design jewelry combined with semistones like Amethyst, Lapis Lazuli, Turquoise, Aquamarine, Quartz, African Jade and etc. 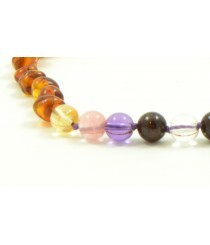 To make your designs even more unique it is also possible to choose different color strings. 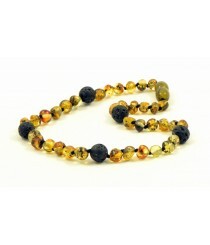 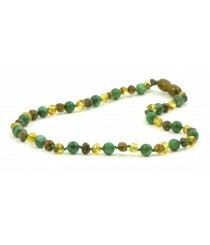 Product ID: B33-L1; Short Description: Polished Baroque Green Amber and Labradoryth Combination Necklace for Babies; Min. 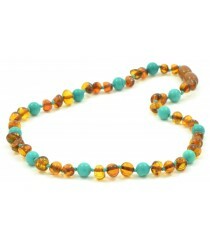 Order Quantity: 10 pieces; Style: Baroque; String: Poliester (100%); Necklace Weight: ~9 g; Clasp: Pop or Screw Clasps can be chosen; Color: Green; Length: ~32 cm (12.6 inches); Amber: Polished. 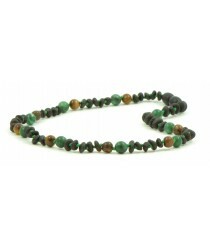 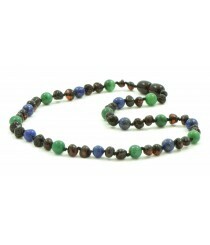 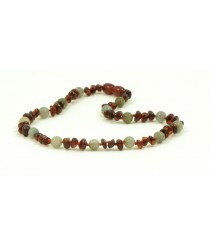 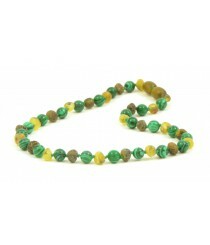 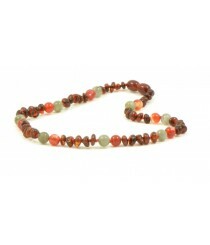 Product ID: B34-G1; Short Description: Polished Baroque Green Amber and Labradoryth Combination Necklace for Babies; Min. 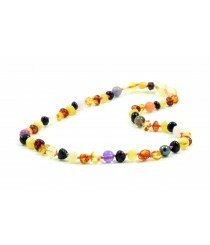 Order Quantity: 10 pieces; Style: Half Baroque; String: Poliester (100%); Necklace Weight: ~8-9 g; Clasp: Pop or Screw Clasps can be chosen; Color: Cherry; Length: ~32 cm (12.6 inches); Amber: Polished.